Introduction Invasive fungal infections (IFIs) remain a significant threat to pediatric patients with hematological malignancies and to those undergoing stem cell transplantation. IFIs not only increase mortality and morbidity but may also lead to delayed administration of chemotherapy, prolonged hospitalization, and additional costs associated with antifungal therapy. Early detection and appropriate treatment is crucial for the survival of these patients. Aim The aim was to determine the value of real-time (RT) PCR, using a panfungal marker, in screening pediatric patients with hematological malignancies for early detection of IFIs. Patients and methods This study included 50 children previously diagnosed with different hematological malignancies and admitted to the Pediatric Hematology, Oncology and Intensive Care Units of Ain Shams University Children Hospital for treatment and follow-up. Children were clinically suspected as having an IFI. There were 20 (40%) females and 30 (60%) males, with their ages ranging from 2 to 18 years (median: 6; interquartile range: 4–10.25). Venous blood was collected from all patients and was submitted for the diagnosis of IFI by conventional blood culture and RT-PCR assay using universal fungal primers for amplification of the internal transcribed spacer 1 and internal transcribed spacer 4 regions. Results Of the 50 studied cases, 40% were positive for IFI by both blood culture and the panfungal PCR. A total of 12 (24%) patients were positive by the panfungal PCR only and the remaining 36% were negative by both assays. There was a statistically moderate agreement between the results of blood culture and that of RT-PCR for the detection of the panfungal marker (κ=0.545). Conclusion RT-PCR assay, using the panfungal marker, is a rapid and sensitive assay that can be reliably used for screening hematological malignant patients at high risk of IFIs. The negative predictive value of the assay is 100%; thus, it can provide greater confidence in excluding a diagnosis of IFIs when negative results are obtained. This, in turn, can help prevent unnecessary toxicity resulting from empirical antifungal treatment in individuals who may not be at risk of imminent fungal disease. However, the RT-PCR for the detection of the panfungal marker lacks specificity, making the interpretation of positive results a challenge. A volume of 1–3 ml was injected into a BACTEC Peds Plus (Becton, Dickinson and Company (BD), Franklin Lakes, New Jersey, USA) blood culture bottle. A volume of 3 ml was mixed with EDTA and was recruited for panfungal PCR. A volume of 2 ml was injected into another EDTA-containing tube and was submitted for complete and differential blood count using Beckman–Coulter (GENs; California, USA.). A volume of 2 ml was injected into a plain tube for the assessment of C-reactive protein (CRP) using CRP-latex slide agglutination test (Spinreact, Girona, Spain). The included 50 patients’ demographic, clinical, and laboratory tests are summarized in [Table 1]. Invasive fungal disease was detected in 20 of the 50 (40%) studied patients using the BACTEC Ped Plus blood culture bottles. 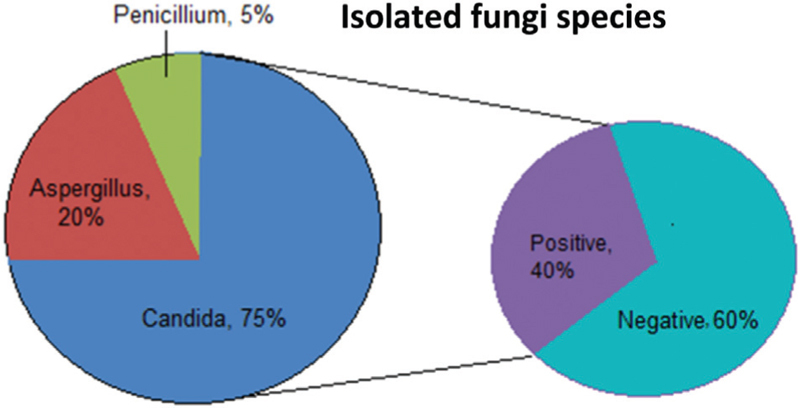 Candida albicans constituted 75% (15/20) of the isolated fungal pathogens. Aspergillus fumigatus was isolated from 20% (4/20) of positive blood cultures, and Penicillium spp. was isolated from the remaining 5% (1/20) ([Figure 1]). Figure 1 Results of blood culture-isolated fungi and species identification. The RT-PCR assay using the panfungal marker was able to detect IFI in 64% (32/50) of the studied cases. The remaining 36% (18/50) had PCR-negative results. There was a statistically moderate agreement between the results of blood culture and that of real-time PCR regarding the detection of the IFI (κ=0.545) ([Table 2]). The 20 cases that were positive by the blood culture were also positive by the panfungal RT-PCR assay. Yet, 12 (40%) of 30 negative blood culture cases were found to be positive by the panfungal RT-PCR assay, and the remaining 18 (60%) cases were negative by both tests. 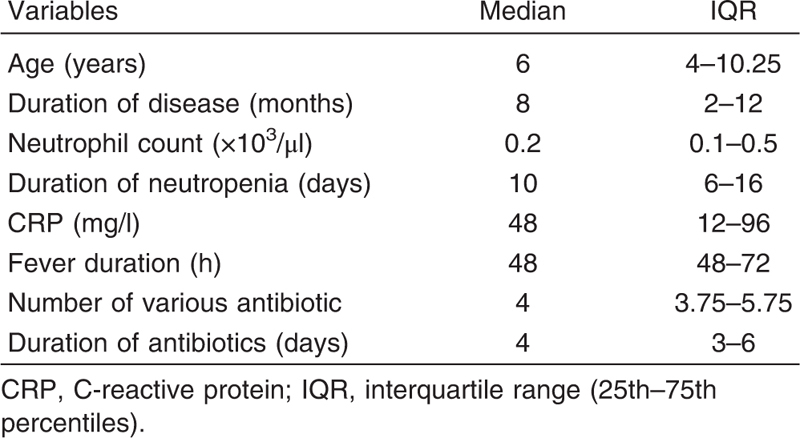 No significant difference was observed between the PCR-positive and the PCR-negative cases regarding age, the duration of the disease, neutrophil count, the duration of neutropenia, CRP levels, the duration of fever, and the number and duration of antibiotics intake (P>0.05) ([Table 3]). 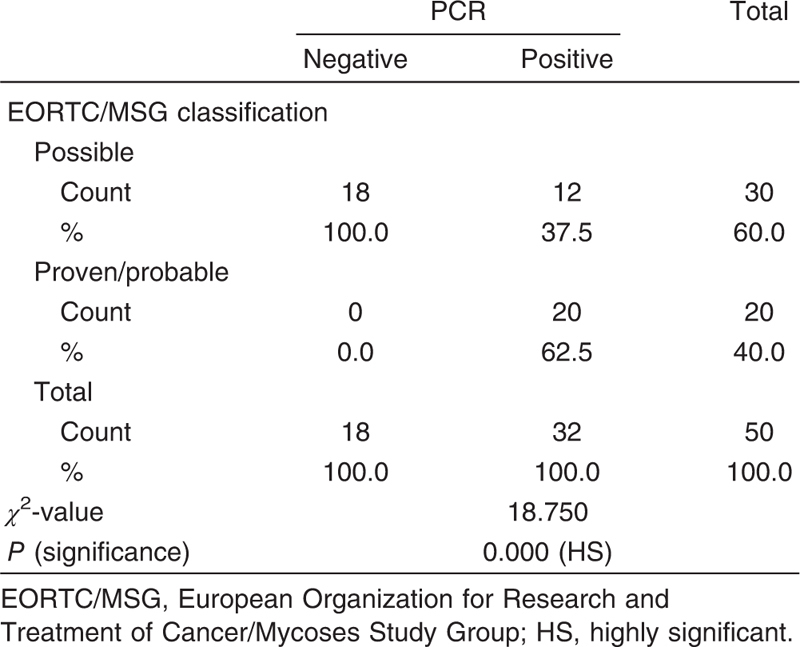 A highly significant association was observed between the RT-PCR using the panfungal marker and the EORTC/MSG classification (P<0.01) ([Table 4]). Badiee P, Zareifar S, Haddadi P, Jafarian H. Incidence of fungal infections in pediatric patients with hematologic neoplasms. Arch Pediatr Infect Dis 2016; 5:e41317. Capoor M, Puri S, Raheja H, Mohindra R, Gupta D, Verma P et al. Screening of invasive fungal infections by a real-time panfungal (pan-ACF) polymerase chain reaction assay in patients with haematological malignancy. Indian J Med Microbiol 2017; 35:41–47. Ascioglu S, Rex J, De Pauw B, Bennett J, Bille J, Ckaert F et al. Defining opportunistic invasive fungal infections in immunocompromised patients with cancer and hematopoietic stem cell transplants: an international consensus. Clin Infect Dis 2002; 34:7–14. Rex J. Galactomannan and the diagnosis of invasive aspergillosis. Clin Infect Dis 2006; 42:1428–1430. Lass-Florl C, Mutschlechner W, Algner M, Grif K, Marth C, Girschikofsky M et al. Utility of PCR in diagnosis of invasive fungal infections: real-life data from a multicenter study. J Clin Microbiol 2013; 51:863–868. Bretagne S. Primary diagnostic approaches of invasive aspergillosis – molecular testing. Med Mycol 2011; 49:S48–S53. Clardo D, Lucke K, Imhof A, Bloemberg G, Bottgere EC. Systematic internal transcribed spacer sequence analysis for identification of clinical mold isolates in diagnostic mycology: a 5-year study. J Clin Microbiol 2010; 48:2809–2813. Landlinger C, Preuner S, Baskova L, van Grotel M, Hartwig N, Dworzak M. Diagnosis of IFI by a real time panfungal PCR assay in immunocompromised pediatric patients. Leukemia 2010; 24:2032–2038. Burik J, Myerson D, Schrekhise R, Bowden R. Panfungal PCR assay for detection of fungal infection in human blood specimens. J Clin Microbiol 1998; 36:1169–1175. Leinberger D, Schumacher U, Autenrieth I, Bachmann T. Development of a DNA microarray for detection and identification of fungal pathogens involved in invasive mycoses. J Clin Microbiol 2005; 43:4943–4953. Kovacicova G, Krupova Y, Lovaszova M, Roidova A, Trupl J, Liskova A et al. Antifungal susceptibility of 262 bloodstream yeast isolates from a mixed cancer and non-cancer patient population: is there a correlation between in-vitro resistance to fluconazole and the outcome of fungemia? J Infect Chemother 2000; 6:216–221. Sogaard M, Hjort U, Hojbjerg T, Schonheyder H. Detection of candidaemia in high risk patients: can yield of blood cultures be improved by blind subculture? Scand J Infect Dis 2006; 38:187–191. Badiee P, Kordbacheh P, Alborzi A, Malekhoseini S, Ramzi M, Mirhendi H et al. Study on invasive fungal infections in immunocompromised patients to present a suitable early diagnostic procedure. Int J Infect Dis 2009; 13:97–102. Pagano L, Caira M, Candoni A, Offidani M, Fianchi L, Martino B et al. The epidemiology of fungal infections in patients with hematologic malignancies: the SEIFEM-2004 study. Haematologica 2006; 91:1068–1075. Selim S, Hammouda A, Sadek N, Ahmed M, Al-Kadassy A. Fungal infection among patients with some hematopoietic disorders. Egypt Public Health Assoc 2006; 81:321–336. El-Sayed Z, Hasan Z, Nasr R. Real-time PCR in the early detection of invasive fungal infection in immunodeficient infants and children. Egypt J Pediatr Allergy Immunol 2012; 10:67–74. Donowitz G, Maki D, Crnich C, Pappas P, Rolston K. Infections in the neutropenic patient – new views of an old problem. Am Soc Hematol 2001; 1:113–139. Portugal R, Garnica M, Nucci M. Index to predict invasive mold infection in high-risk neutropenic patients based on the area over the neutrophil curve. J Clin Oncol 2009; 27:3849–3854. Villarroel M, Aviles C, Silva P, Santolaya M. Risk factors associated with invasive fungal diseases in children with cancer and febrile neutropenia. Pediatr Infect Dis J 2010; 29:816–821. Rowen J, Tate J, Nordoff N, Passarell L, Mcginnis M. Candida isolates from neonates: frequency of misidentification and reduced fluconazole susceptibility. J Clin Microbiol 2001; 37:3735–3737. Saiman L, Ludington E, Dawson J, Patterson J, Rangel-Frausto S, Wiblin R et al. Risk factors for Candida species colonization of neonatal intensive care unit patients. Pediatr Infect Dis J 2001; 20:1119–1124. Dutta S, Murki S, Varma S, Narang A, Charabarti A. Effects of cessation of a policy of neonatal fluconazole prophylaxis on fungal resurgence. Indian Pediatr 2005; 42:1226–1230.